Chester County has a number of bus routes that service several areas, but not the entire County. Much of the bus routes are located along the County's major transportation corridors or large populated areas. Five different transit agencies provide bus service in the County and the region and are as follows: SEPTA, TMACC, GVFTMA, Krapf's Coaches Inc., and PART. The table below showcases all bus routes located in or in proximity of Chester County. Connecting services include Krapf's "A" bus, SCCOOT, GVF's UM Rambler, SEPTA bus routes 99, 104, 106, 123, 124, 125, 139, 204, 205, 206 and Amtrak/SEPTA's Exton, Malvern and Paoli train stations. Connecting services include GVF's UM Rambler, SEPTA bus routes 92, 93, 123, 124, 125, 139, and SEPTA's Norristown Transportation Center. Connecting services include Krapf's "A" bus, SCCOOT, SEPTA bus routes 92, 106, 120, and 123 and SEPTA's 69th Street Transportation Center. Connecting services include SEPTA bus routes 92, 106, 120, 123, 204, 205, 206, Amtrak/SEPTA's train stations Paoli, Daylesford, Berwyn, Devon, Strafford, Wayne, St. Davids, Radnor, Villanova and SEPTA's 69th Street Transportation Center. Connecting services include SEPTA bus route 120 and SEPTA's Chester Transportation Center. Connecting services include SEPTA bus routes 92, 106, 123 and SEPTA's 69th Street Transportation Center. Connecting services include GVF's UM Rambler, SEPTA bus routes 92, 99, 123, 125, 139, and SEPTA's Gulph Mills NHSL station. Connecting services include GVF's UM Rambler, SEPTA bus routes 92, 93, 99, 123, 124, 125, and 205. Connecting services include Krapf's Coaches route "A", SEPTA bus routes 92, 106, 205, 206 and Amtrak/SEPTA's Paoli train station. Connecting services include SEPTA bus routes 92, 106, 124, 204, 206 and Amtrak/SEPTA's Paoli train station. Connecting services include SEPTA bus routes 92, 106, 204, 205 and Amtrak/SEPTA's Paoli train station. Connecting services include LINK, SCCOOT, SEPTA bus routes 92, 104, 204, 205 and Amtrak/ SEPTA's Exton, Downingtown and Thorndale train stations. Connecting services include Krapf's Coaches "A" and SEPTA bus routes 92 and 104. Connecting services include Krapf's Coaches "A". Connecting services to SEPTA bus routes 92, 99, 123, 124, 125, and 139. Connecting services to PART bus routes High Street, Upland Square, East End Loop, South End Loop and SEPTA bus route 93. SEPTA has over 100 bus routes that serve various destinations in the region, 14 of which serve areas within or immediately adjacent to Chester County. These routes connect to major destinations located along major corridors in the County, such as US Business 30, US 202, PA 3, PA 23, PA 29, PA 100, and PA 724. Chescobus provides service within Chester County in areas that are not covered by SEPTA. Both the LINK and SCCOOT Routes are managed by TMACC. For more information about these bus routes please go to www.tmacc.org/chescobus/. 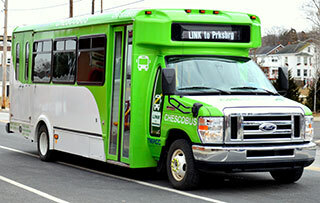 Chescobus provides monthly bus passes for each route which can be purchased on their website. For additional information on TMACC's bus service and for up to date schedules please go to www.tmacc.org/chescobus/ or call TMACC at 610-993-0911 or toll free (877)-612-1359. The LINK Route service area is comprised of the Lincoln Highway corridor, with stops at the Brandywine Hospital, Veterans Administration Medical Center, and Wal-Mart Super Center/West Sadsbury Commons and Parkesburg. The LINK Route also provides limited evening service to Exton, providing access to hundreds of jobs in the retail, service and hospitality. The LINK offers connecting service to Krapf's Coaches Route "A" bus and Amtrak's Coatesville and Parkesburg train stations. For more information about this route please go to www.tmacc.org/chescobus/ or call TMACC at 610-993-0911 or toll free 1-877-612-1359. The SCCOOT Route provides service between the Borough of Kennett Square and the Borough of Oxford. SCCOOT also provides transportation to Lincoln University in Oxford. There is also limited service to West Chester, providing access to West Chester University and county governmental agencies. 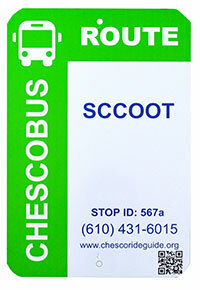 SCCOOT offers connecting service to Krapf's Coaches Route "A" and SEPTA bus routes 92 and 104. For more information about this route please go to www.tmacc.org/chescobus/ or call TMACC at 610-993-0911 or toll free (877)-612-1359. As opposed to a traditional paratransit system, Chescobus uses its existing fixed route fleet (SCCOOT and LINK) to fulfill the ADA mandate to provide service to disabled passengers within Â¾ of a mile of the fixed route service. Because Chescobus operates a fully accessible fleet, they can deviate from the normal route operations to pick-up ADA passengers on an on-demand basis. For more information and how to apply for this service please go to TMACC ADA Services or call 610-993-0911 or toll free 1-877-612-1359. Since 1992, Krapf has provided public bus transportation on the Route "A" between Coatesville, Downingtown, Exton and West Chester, picking up more than 1,200 daily passengers in those areas seven days a week. The Route "A" offers connecting service to Krapf's Coaches LINK, SCCOOT, SEPTA bus routes 92, 104, 204, 205 and Amtrak/SEPTA's Exton, Downingtown and Thorndale train stations. For more information about this route please go to Krapf Route "A" or call Krapf Coaches at 610-431-1500. For more about this service please go to Krapf’s special-needs or call 610-431-1500. 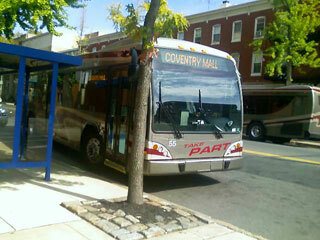 PART's Stowe - Pottstown - Coventry Mall bus serves both Chester and Montgomery County employees and residents located around the Pottstown area. This route offers connecting services to PART bus routes High Street, Upland Square, East End Loop, South End Loop and SEPTA bus route 93. For more information and schedule call PART at 610-326-5413. GVF's Upper Merion Rambler shuttle serves the King of Prussia Mall and surrounding area. Although the shuttle does not travel inside of Chester County, the UM Rambler meets the commuting needs of both employees and residents located within the area. The UM Rambler offers connecting services to SEPTA bus routes 92, 99, 123, 124, 125, and 139. For more information and schedule call GVF at 610-354-8899.